Georges Niang helped revive Iowa State basketball into a name school across the country, combined with the exploits of alum and former coach Fred Hoiberg. Niang was an under-recruited kid from Massachusetts who couldn’t get any scholarship offers from schools in the area, and became a national force in Ames. But, if he was to run for mayor of Ames, Iowa against his former coach who is the “Mayor of Ames”, would he win? The Des Moines Register put together a funny video trying to convince Niang to try it out, and the results are pretty spectacular. 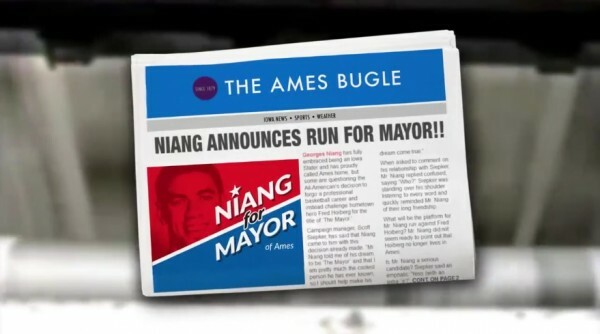 Not sure politics is in Niang’s future, or that Hoiberg’s colloquial title as the Mayor of Ames is going anywhere, but it’s a touching, humorous send-off to one of the most successful basketball players for Iowa State that helped spark their recent renaissance.